Born with multiple heart defects, Jaden had two operations between 9 months-old and 2 years-old. At the age of 11, his heart began to fail for no known reason. It was determined that Jaden’s heart was functioning at a severely depressed level. This resulted in him being listed for a transplant at age 13. 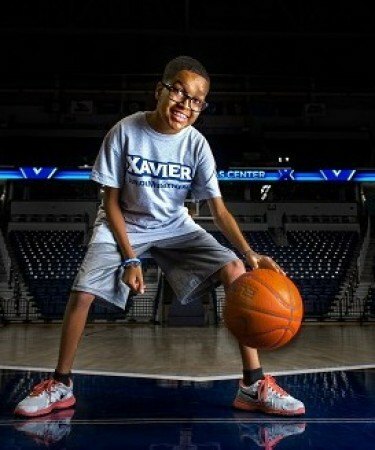 When he was listed, Jaden shared that he was excited to receive his new heart because it would allow him to play sports like basketball, which at that point he hadn’t been healthy enough to enjoy. He also looks forward to studying to one day be a cardiologist so he could help other children with heart struggles. On August 6, 2014, Jaden and our family received the call that his new heart had finally come. On August 7th, his mom’s birthday, his heart transplant was completed. As his family, we are so thankful for his new life. He is experiencing oxygen saturation levels at 100 percent for the first time in his life! He has full color in his face and fingertips and he now is able to walk distances without having to sit down to catch his breath. Jaden shared with us, his parents, on his way in for his transplant that he was thankful his new heart was finally here even though he was nervous about the surgery. We all regularly think about the sacrifice that a family made for him and that is not lost on anyone in our family, especially Jaden. We are just so thankful for this gift!